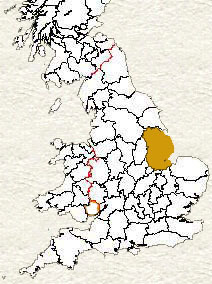 Lincolnshire is the location of the most populated area for PASK and PASKE families. My own family originated from Great Gonerby, Lincolnshire. We have been researching the Lincolnshire PASKs for over 20 years and have transcribed the PASK entries from most Lincolnshire parish records listed in the International Genealogical Index (IGI), and more. However, not all available records have been computerised. These are being included as and when time allows. So contact us for additional information. The earliest known progenitor in Lincolnshire is Johannis PASK, born c1545. He married Margaret CORK on 15 July 1569. It is believed she died as he married Elizabeth ARCHER on 11 November 1576 in Washingborough, Lincolnshire. In the narratives section, the icon indicates Johnannis and Elizabeth's descendants. His son William born in 1577 also married an Elizabeth ARCHER on 8 July 1604 in Washingborough. Johannis' descendancy chart shows 12 generations. Another main progenitor in Lincolnshire is William PASKE, born in Wellingore c1690. His wife was Susanna. In the narratives section, the icon indicates William and Susanna's descendants. William Pask was born in 1769 in Lincolnshire although which town he originated from is not known. He lived in Fulbeck, Lincolnshire. In the narratives section, the icon indicates William Pask's descendants. John PASK (1760-1826), and Alice WOODCOCK are my own ancestors. They were the earliest recorded Pasks in Great Gonerby. The icon indicates John and Alice's descendants. Additionally the icon indicates my own ancestors, both paternal and maternal. Further details on Lincolnshire and these registration districts are available on Genuki. Sincere thanks to the many co-researchers for contacting us and sharing their research. You can find co-researchers listed in the citations for the individual narratives. If your family lives or originated from Lincolnshire contact us, we would be grateful for any information.